ART OF TRANSIT: Reader quick — where’s this bus stop? Hint: a representation of this building was in “Indiana Jones and the Last Crusade.” Answer after the jump. Photo by j@ck, via Flickr creative commons. The Board of Airport Commissions on a 6 to 1 votes approved a package of modernization projects for Los Angeles International Airport on Tuesday. The contentious one is moving the northern runway 260 feet to the north for safety and commerce reasons — meaning the runway would be closer to Westchester homes. Other projects include a people mover and consolidated rental car facility. The plan still must be approved by the FAA, L.A. County and the L.A. City Council — and there’s no timetable on when the people mover would be built. That’s important because a people mover could connect with the Crenshaw/LAX Line or an extension of light rail onto the airport grounds. What remains unclear is whether a lawsuit against the runway project — which seems likely — could also hold up the other projects that are part of the plan. The annual report from the Texas Transportation Institute finds that D.C. motorists waste 67 hours each year stuck in traffic compared to 61 hours for Angelenos and those driving in the Bay Area. Not exactly a surprise that traffic here continues to stink, eh? Of course, there are many ways to measure traffic and/or commuting; the average 29.1 minutes commuting time for Los Angeles County commuters (of which 83.3 percent commute by car) is pretty typical for large cities: San Francisco County (29.5 minutes), San Diego County (24.5 minutes), King County/Seattle (25.5 minutes), New York County (30.1 minutes), Miami-Dave (29.2 minutes), Cook County/Chicago (30.8 minutes), Harris County/Houston (27.7 minutes). These numbers come from the U.S. Census Bureau. To look up commuting time for a state, county or city, start here. Then pick a county or city, then click “browse data sets” on the righthand top of the screen. On the next page, click on “economic characteristics” under the American Community Survey header. A $132-million contract was approved by the Riverside County Transportation Commission on Monday to build the 24-mile extension from Riverside to Perris. The project, however, is being challenged by an environmental group in court, who say the environmental studies failed to disclose all of the project’s impacts. That case is expected to be resolved in the next few months. The $1.6-billion plan includes major upgrades to the company’s production facilities, new hotels, as well as a new park along the adjacent L.A. River and $100 million in transportation upgrades. Approvals are still needed from L.A. County. The project was in limbo for years until plans for 3,000 residences were dropped. Nice post with many photos of the train stations that pre-dated Union Station in downtown Los Angeles. Before Union Station, the large railroads usually had their own depots – some of which were quite striking. Most were on the eastern side of downtown between Central and the the Los Angeles River. Here’s an idea for another post: the old train stations around town still standing. Just off the top of my head, the old South Pasadena station is now in the County Aboroteum in Arcadia, the Pasadena station now hosts two restaurants adjacent to the Gold Line’s Del Mar Station and old Santa Fe depots — neither in very good shape — can be seen in Monrovia and Azusa, respectively, and will be next to the Gold Line Foothill Extension that is under construction. The theory goes that if everyone followed Europe’s lead and worked a little less and vacationed a little more, overall consumption of energy would go down — meaning fewer greenhouse gases emitted and a slighter increase in global temperatures. I see no reason to doubt any of this and I’ll be back in two hours. Taking transit, btw, is another good way to lower your carbon footprint. That’s Tempelhof Airport in Berlin, where Indy and his father boarded a zeppelin to exit Germany. In the move, the administration building on Treasure Island in San Francisco was used for the airport’s exterior. Has there ever been a consideration, on the federal or the state level, to protect transit related projects from lawsuits? All these lawsuits, whether it be LAX expansion project, Subway to the Sea, the CAHSR project, etc. adds up to more cost to the taxpayer that prevents things from getting done. Of course there is the constitutionality issue regarding this. We don’t want to end up like China where they bulldoze homes as they see fit to build a bullet train with no recourse from those affected. But there has to be a way to limit these “we’re building X, oh no you don’t we’re going to sue the pants off of you” which just ends up being more tax dollars. The biggest problem with DC traffic, alluded to in the report, is its unpredictability. You know how LA gets during a Presidential visit. Now imagine that happens every week, because the President, Vice President, or some foreign leader comes to town. Not sure if any action has been taken (this is government after all) but the governor has stated that he wants reform, so here’s hoping. Don’t forget the North Hollywood Station, Steve! BTW- when is Metro going to do something about that? I walk by it every day and night, and the only getting some use out of it, are fera cats! There’s also the Santa Fe Depots in Phase II of the Foothill Extension. San Dimas, North Pomona, and Claremont all still have historic depots which will be near future stops. 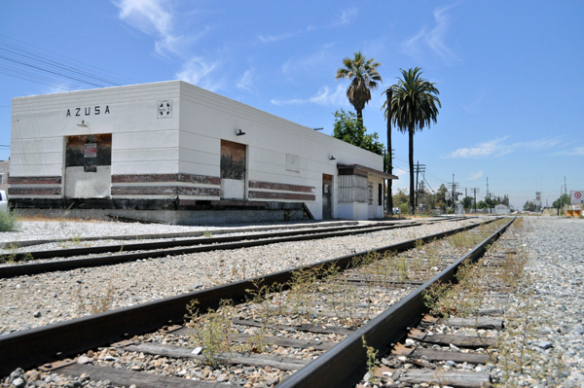 The San Dimas depot is now a train museum, while the North Pomona depot is currently a Metrolink maintenance office (too far removed from the modern platform for passenger use). The Claremont one, though, is now a multi-modal facility in regular use by Metrolink passengers. It also features a Foothill Transit Store and a BikeStation in the old cargo room.